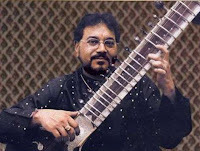 Kushal Das was born in Kolkata and received his first lessons on the sitar from his father, Sri Sailen Das, and his uncle, Sri Santanu Das, in 1959. He deepened his studies later under the guidance of Prof. Sanjoy Banerjee and Pandit Ajoy Sinha Roy. In order to accomplish a more profound understanding of Raga interpretations he takes additional vocal lessons with Pandit Manas Chakraborty and Sri Ramkrishna Basu. Kushal Das is a "grade A musician" at All India Radio and Doordarshan - the leading media regarding classical Indian music in India itself. Since 2002 Kushal Das also plays the Surbahar in addition to the Sitar.